Yes, There's Such A Thing As An Ice Hotel. Hotels come in all styles these days from treehouses to converted airplanes, an igloo to historic castles. Whereas accommodations may have once been just an afterthought in the planning of a trip, today some hotels are becoming the destination itself. One example is the original ice hotel. The ice hotel in Sweden’s Jukkasjärvi village is a destination in and of itself. 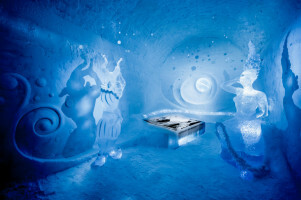 Founded in 1989, it is the first ice hotel to have ever opened and is just 200 kilometers north of the Arctic Circle. In other words, it. is. cold. 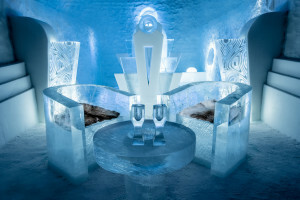 Made entirely of ice and snow, the hotel has over 150 rooms with the option of both warm chalets and traditional, ice rooms; as well as an ice bar, ice sculpting studio and hand cut ice crystal chandeliers. Art You Can Sleep In. Like a living art project, the ice hotel has worked with over 500 artists who have each made their contribution to this iconic place. Despite being in the cold, the ice hotel is around -5 C/21 F warmer than the outside temperatures due to the insulating effect of the snow. A stay at the ice hotel is a novelty experience and while it may be cold--look at the bright side--all your cocktails will be nice and chilled! A destination in of itself. The first ice hotel in the world. 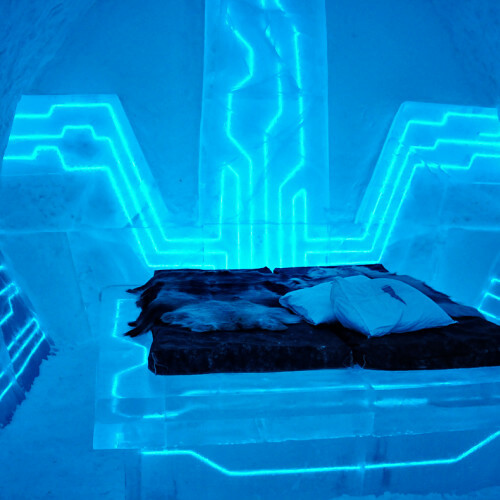 Made entirely of ice and snow, so spectacular to see and a novelty to stay in! An art project: including incredible hand cut ice chandeliers and sculptures. You are given access to your room at 6 pm, but the heated service building, the Riverside Lobby, is staffed and open 24 hours, this is where you store your belongings, collect your sleeping bag and use the bathroom, shower and sauna.